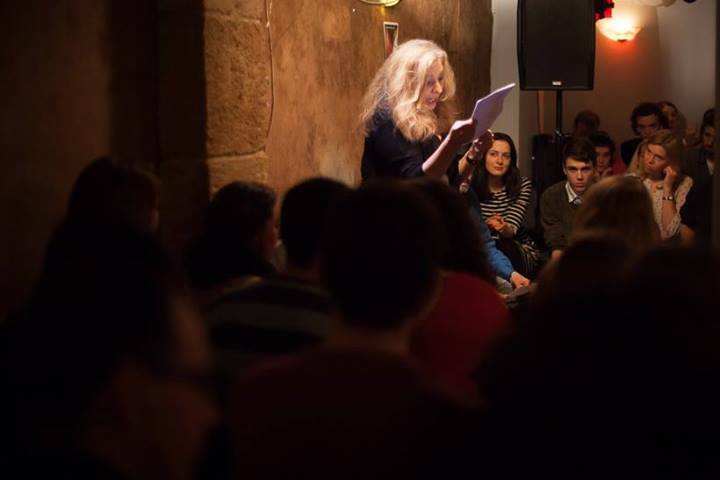 Poet & good friend of the Cambridge Writers’ Workshop, Antonia Alexandra Klimenko, was recently featured reader at SpokenWord Paris. SpokenWord Paris is an Open mic run by David Barnes & Alberto Rigettini, and meets every Monday 8.30pm-12pm at Au Chat Noir, 76 rue Jean-Pierre Timbaud, Paris 75011, France. The Cambridge Writers’ Workshop was excited to be featured at SpokenWord Paris this past summer during our 2013 Château de Verderonne Yoga & Writing Retreat. Antonia’s poem excerpt from “Art isn”t Dead –It’s Stiil Dying” will be archived in the Smithsonian’s Maintenant 8: Journal of Contemporary Dada Writing and Art, which will also will also be archived at New York’s Museum of Modern Art. Maintenant 8: Journal of Contemporary Dada Writing and Art (ed. Peter Carlaftes and Kat Georges) is a stunning collection of poetry and art, and Antonia is both honored and delighted to find herself in the company of Allen Ginsberg, William S. Burroughs, Jerome Rothenberg, Steve Dalachinsky and others such as Jan Michael Alejandro, Fork Burke, Phillip Meersman, and Joel Allegretti. This entry was tagged Antonia Alexandra Klimenko, France, MoMA, poetry, Smithsonian, SpokenWord Paris. Bookmark the permalink.